I have been enjoying an unusual number of raw (or mostly raw) vegetable salads over the past month. It started with the shaved vegetable salad I posted in early June...and has continued as the local cabbage crop has hit its stride. I can't help but think that this is due in part to the large variety and quality of vegetables that I have been finding at the Brookside Farmers' Market this year. Every week I come home laden with fantastically beautiful produce...produce that is often so fresh and bursting with life that I just want to eat it raw. Lunch time has become an adventure in raw vegetable salads....salads that often don't even include lettuce. 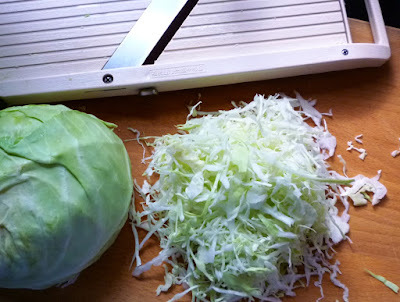 The vegetable salad I'm sharing today is technically a coleslaw (which I learned recently is from the Dutch—koolsla—and simply means "cabbage salad"...). I have to admit that I have never liked coleslaw very much. But as has almost always been the case with me, I have found that this was probably due to the fact that I had a bad taste in my mouth from inferior versions—in this case courtesy of fast food and BBQ joints. 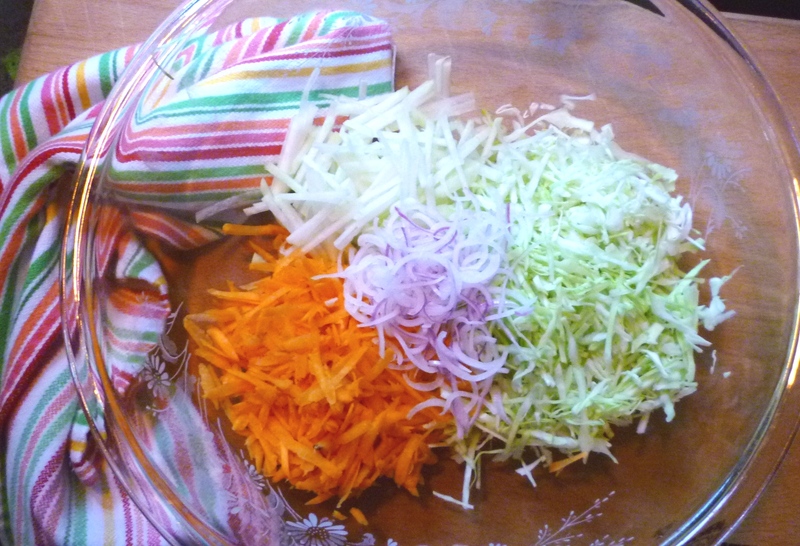 Cabbage salad...made with fresh cabbage combined with interesting ingredients and a tangy dressing (creamy...or not)...is delicious, addictive and oh so versatile. It can be a side, a garnish...or the main vegetable component of an entrée. A couple of weeks ago the first of the sweet corn crop started to trickle into Kansas City's City Market. I make a special trip to my old market just to get corn.... I love sweet corn. And I love it roasted and tossed in a salad. 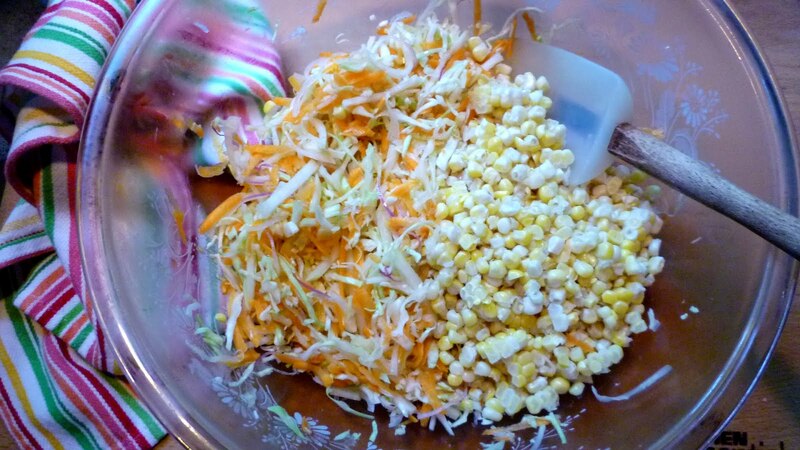 So, inspired by a grilled corn slaw from Yotam Ottolenghi, I decided to add some to a batch of coleslaw. 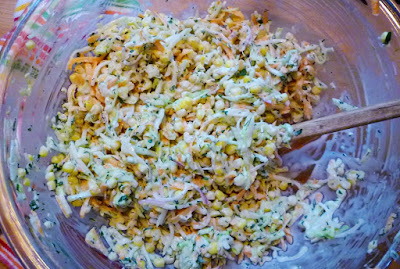 Combined with finely sliced fresh cabbage, grated carrots, julienned kohlrabi (also inspired by Ottolenghi), a tiny hint of shaved red onion...and doused with a generous quantity of a freshly made tangy & herby ranch dressing...it made a fantastic and slightly sweet coleslaw (without having to add any sugar). We enjoyed it with a pork chop....and also with a pan-seared chicken cutlet. I know it would be equally good with a grilled burger...or some classic Kansas City style barbeque. 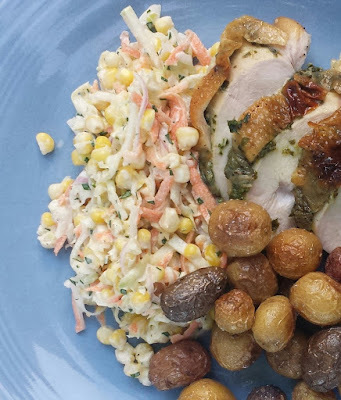 It was my intention to have this recipe posted in time for Independence Day. And I suppose it is technically in time... But I imagine most people already have their menus set for their celebrations. But if you do not...and you have access to delicious local cabbage and corn (and kohlrabi and carrots! 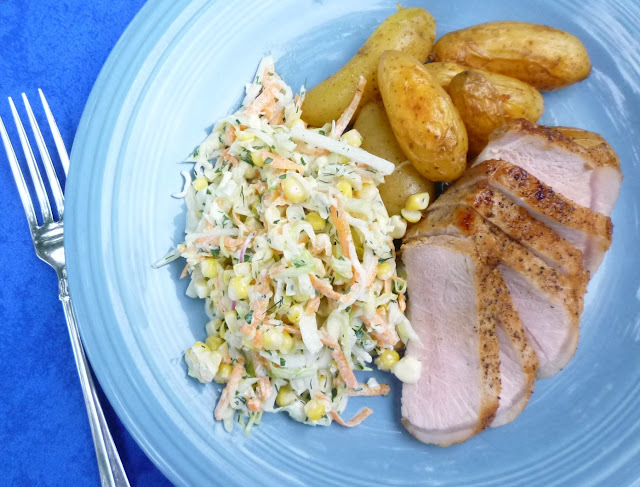 )...you most certainly have time to add this to your menu—it comes together in a snap. 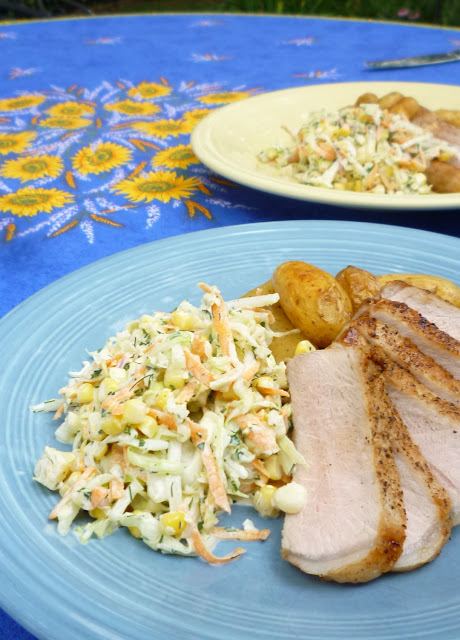 If, on the other hand your plans are set, you should definitely make plans to make this slaw sometime soon. Corn...and cabbage...season has just begun. 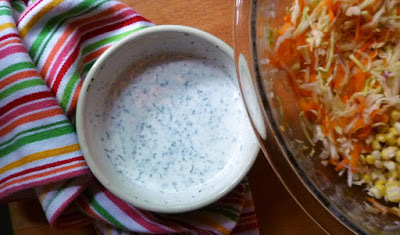 And even if you think you don't like coleslaw...you should give this salad a try...it might just change your mind. Place the first four ingredients in a large bowl and add a half tablespoon of lemon juice and a half teaspoon of kosher salt. Toss to distribute the salt and lemon. Set aside for an hour (refrigerating if the room is warm). Cut the kernels away from the corn cobs. Run the back of your knife down the length of each cob, going all the way around, releasing the "milk" and residual bits of corn. Add these scrapings to the kernels. You should have about 2 cups of cut corn. Add the corn to the bowl of shredded vegetables and toss to combine. Drizzle in about 2/3 to 3/4 of the dressing and toss to coat. Add as much of the remaining dressing as is necessary to coat everything and make a moderately creamy slaw. Taste and correct the seasoning with kosher salt, black pepper and lemon juice. If you like a very sweet slaw, you might need to add a drizzle of honey...but I find that the corn and carrots add plenty of sweetness without additional sugar. If not serving immediately, chill. This slaw keeps well for 3 or 4 days. Serves 6 generously as a side. Note: You may of course vary the herbs as you prefer. More dill will give a tangier impression...more mint a sweeter flavor profile. Hello! I just discovered your blog this past weekend. It is now bookmarked as a favorite, as your recipes seems similar to my style. Oddly enough, I made a similar coleslaw this weekend as I too had corn and cabbage from the local farm market. (I'm in Ohio.) 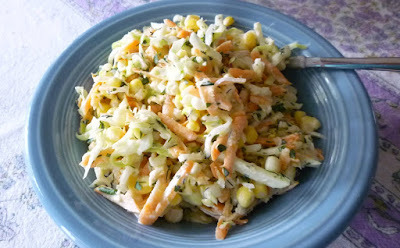 I had never added corn to slaw previously, but thought, why not? It might add a bit of sweetness. I look forward to more of your blog recipes. Yes! 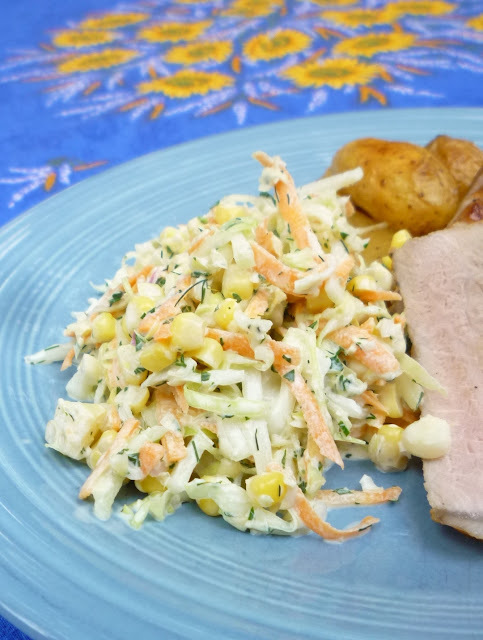 The sweet corn definitely compliments the cabbage, doesn't it? Thanks for taking a moment to comment and let me know you visited. Happy Cooking!